Founder and president of Living Lands & Waters, Chad Pregracke, is proof that one person can make a difference. Chad told journalists at a PERC conference back in 2003 about his plans to clean up the cluttered Mississippi River. Turns out he’s doing it! Chad was recognized March 21 at the Points of Light Institute’s “All Together Now” celebration, which was shown last night on NBC-TV to a national audience. The event also honored former President George H.W. Bush for his leadership in American volunteer service. He and three other former presidents — George W. Bush, Bill Clinton, and Jimmy Carter — were in attendance. 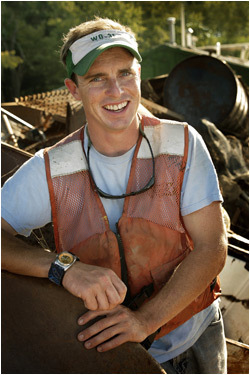 Chad has won countless awards for leading a push to clean trash out of the Mississippi River. In his spare time he wrote From the Bottom Up: One Man’s Crusade to Clean America’s Rivers. You can watch him on ReelCYCLE: The Rivers’ Garbage Man.